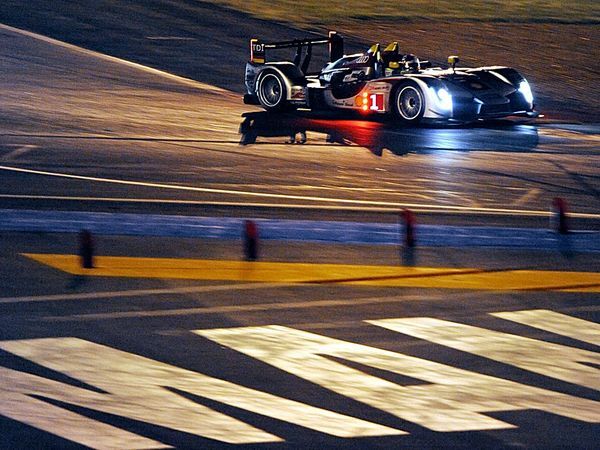 Skill, speed, and stamina are the three s’s that mark the world’s best automobile race, the 24 Hours of Le Mans. The race, organized by Automobile Club de L’Ouest, bridges past and present on the automotive circuit. The competition is set on a non-permanent track at Circuit de la Sarthe near the city of Le Mans on the Sarthe River. Roughly 46 cars start the race, in a series of classes that include prototype high-performance vehicles, dedicated race cars, and street cars. The diversity of autos gives the race a mix of old-fashioned and modern competitors. The winner is the car, driven by a team of three drivers, that covers the greatest distance in 24 hours. The first Le Mans contest took place in May 1923; today it is held every June. The race begins at 4 p.m., and for 24 hours the sound of roaring engines fills 8 miles (13 kilometers) of French countryside. It’s hard to imagine that Zeus and the other gods lording over ancient Greece ever envisioned the global event the modern Olympiad has become. For a two-week span, athletes from dozens of countries compete against each other in scores of different sports. And that’s just the Summer Games, which began their modern run in the late 1800s. The Winter Games, featuring sports that largely require snow and ice, draw a smaller field of competitors. But the competition for the gold, silver, and bronze is just as intense. Remember Tonya Harding and Nancy Kerrigan? National rivalries are varied. Consider the United States hockey team winning the gold over the favored Soviets in 1980; Jamaica’s jubilant 1988 bobsled team overcoming long odds to win hearts, not medals; or Argentina beating America’s 2004 “Dream Team” and going on to capture the gold in basketball. Even the competition among national Olympic committees to host the games is fierce, with bribery accusations and investigations becoming, sadly, the norm in sports news over the last several years. Still the games must go on; to be sure that they do, the International Olympic Committee decided to stagger the Winter and Summer Games. So during every even-numbered year, runners will bear the torch that eventually lights the Olympic flame somewhere in the world. Thirty nations play, but billions of people in countries all around the world drop everything they’re doing for a month every four years to see who claims the title of World Cup soccer champion. The teams that compete in the World Cup finals are those that emerge from a series of qualifying rounds played out over the prior three years. The tournament of tournaments is therefore a showcase of the finest squads from across the continents and hemispheres. It’s during the finals that the intense challenge begins. First, in a series of first-round games, each team plays the three rivals in its opening bracket. Teams get three points for each win, one point for a tie, and zero for a loss. The top two teams in the bracket then move on to the single-game elimination rounds, with victorious teams proceeding though quarterfinal and semifinal rounds before the final championship match. All the while the world’s gaze is squarely fixed on the matches and the festival atmosphere in the stands. Chanting, singing, flag-waving, and superstitions are all part of the carnival that ensues. Since the first World Cup tournament took place in 1930, the most dominant team has been Brazil. Winner of five championships since 1958, the greatest Brazilian teams were led by perhaps the most famous soccer player ever, Pele. Rivalries are often fierce and deeply rooted: Two of the many in the sport are between England and Argentina, and one that has recently emerged between neighbors—Mexico and the United States. The Super Bowl is so big that even the commercials are worth watching. The first Super Bowl (held in January 1967) was played to plenty of empty seats and a waning TV audience. But now Super Bowl Sundays, progressively marked with Roman numerals, are the most celebrated one-game professional championship on the 12-month Gregorian calendar. The Super Bowl concludes a 16-game regular season, and three postseason play-off rounds. It pits the top team from the American Football Conference against the top team from the National Football Conference for the coveted Vince Lombardi Trophy (not to mention diamond-studded rings for players, coaches, and front office “suits”). The Sunday evening spectacle is preceded by two weeks of parties and pre-game hype. The NBA Finals. Showtime and the “Ghosts of the Garden.” Rockets and Knicks, Spurs and Pistons. The National Basketball Association’s finals are a showdown of stars and teams for the ages. It takes four games to win, but at least 93 games to get there. And the teams that do bring a lot of glitter with them. Movie stars in front-row seats. Cheerleaders that resemble Las Vegas show girls in high-energy dance routines. The see-and-be-seen spectacle ringing the court is as intriguing as the game itself. Pro basketball has changed radically over the last four decades. The three-point shot, the slam-dunk, a pendulum swing against defense makes NBA ball a high-scoring, acrobatic affair. What hasn’t changed is the prize, the right to be crowned world champion.